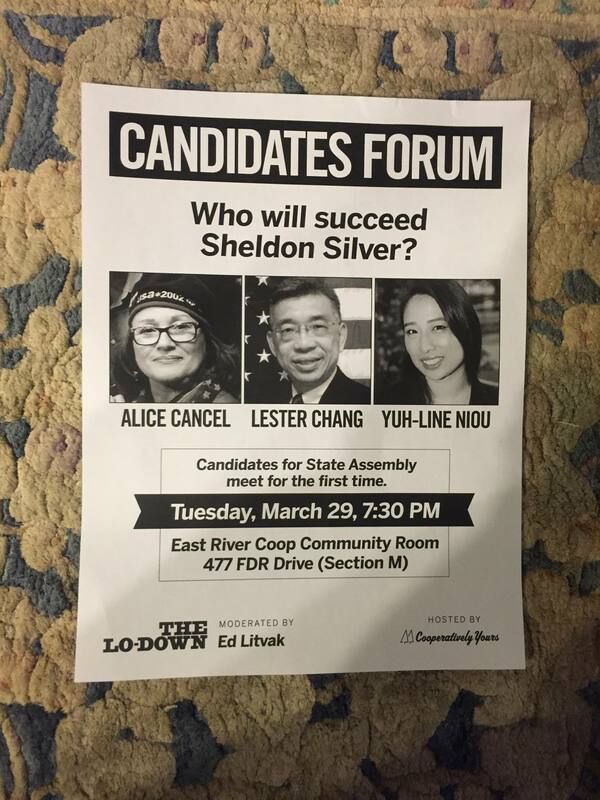 Last night, the candidates for the 65th Assembly District (AD-65) hosted the first debate before the special election to fill Sheldon Silver’s vacant Assembly seat. Moderated by Ed Litvak, the candidates had the opportunity to introduce themselves to the voters on an informal level. After opening statements, the contenders answered a few general question before Litvak shifted the focus to the audience. During the official Q&A period, voters asked candidates to clarify their positions on some of the most pressing issues — including gentrification, Section 8 Housing, and local business. The two-hour event was relatively well attended. In fact, over 100 voters came to the Forum to promote greater government transparency and accountability in the wake of the corruption scandal that rocked Albany. Feeling cheated, blindsided, and angry about the corruption, voters came to demand answers, and stay active in the democratic process. Speaker Sheldon Silver, represented the Lower East Side for almost 40 years. However, Speaker Silver was not just a politician; instead, he was a popular figurehead and staple in the community. Many locals would often see Mr. Silver — whom they called “Shelly” — on Grand Street, and talk to him as if he were their friend. When the voters would see the Speaker at local events, they would nonchalantly approach him to talk to him about their concerns, and the Speaker would often stay until everyone felt heard. Speaker Silver had a unique way of building rapport with his constituency. When voters would talk to Sheldon Silver on the block or at en event, they did not feel like they were talking “business” with their representative. Instead, they would confide in the Speaker as a friend, neighbor, and ally. On the Lower East Side, local elections were not considered a special occasion: Sheldon Silver did not need the election as an excuse to listen to the people — no, Sheldon Silver would always attend events to check-in with his constituents. Voters loved that Speaker Silver was always transparent because they felt represented. He was a local, a friend, and an ally — the voters did not feel the need to question the Speaker because they knew him, and felt comfortable with him. The public saw Speaker Silver as a staple of the community, and their familiarity with Speaker Silver led to detrimental widespread complacency. It should be noted that the Speaker did not have a perfect term. If anything, there were many red flags, including the mishandling of sexual assault and the attempted bouleversement in 2000, but the public did not care for two main reasons: (1) he was never convicted, and (2) they sought solace in the familiar. As far as the public was concerned, Speaker Silver had the experience: with over 30 years under his belt, Speaker Silver was comfortable with the constituents, and could easily strike up a conversation with many of them at popular spots, like the Moishe’s Kosher Bakery on Grand Street, or synagogue. At the same time, voters knew him, felt represented, and developed an attachment to him. With Speaker Silver’s constant public appearances and check-ins, the public did not worry about the Speaker because he had held the position for so long and was always available. Behind the friendly community-oriented facade, Speaker Silver was primarily concerned with his own interests. In the absence of outside income regulations and widespread community concern, Speaker Silver was able to use his power to engage in many illegal backdoor activities to further his own interests. For example, although the Speaker was known for defending the poor, the Speaker would often refer rich real estate developers to Goldberg & Iryami so he could get a piece of the profit. At the same time, the Speaker would give research grants to doctors that referred asbestos cases to his former firm, Weitz & Luxenberg. so he could accumulate more money. Over the course of his terms, Speaker Silver was allegedly enjoying millions of dollars in illegal kickbacks; however, the gravy train stopped when Preet Bharara became the U.S. Attorney for the Southern District of New York. In 2013, Bharara became suspicious of state politicians after Governor Cuomo shut down the anti-corruption commission that he initiated. Concerned with the lack of checks and balances on politicians (including the absence of an outside income law), Bharara decided to dig a little deeper by investigating state politicians — including Speaker Silver. After Cuomo’s anti-corruption league — also known as the Moreland Commission — shut down, Bharara launched an investigation into the sizeable contributions that were being funneled into the Speaker’s pocket. Based on the Moreland Commission’s findings, many payments came from Goldberg & Iryami — a small real-estate firm in Manhattan — and Bharara was dead-set on finding out why. Bharara’s investigation led to many public revelations about Speaker Silver, including the exact extent of his kickbacks, which resulted in Silver’s prosecution, expulsion, and disbarring. With 8 months left until the end of the term, the Lower East Side remains unrepresented. The Lower East Side — and Albany in general — has been a colossal mess in the wake of Speaker of the Assembly, Sheldon Silver’s, scandal. He will be sentenced in April, and, thus, unable to finish his term. As a result, Governor Cuomo forced the 65th Assembly District to hold a “special election” to ensure representation for the remainder of the term. However, there are many issues with the special election. There were *8 months* left of Sheldon Silver’s term, which means that the public was already starting to meet the candidates, and prepare for the primaries before September’s General Election. However, Governor Cuomo still thought that it would be prudent to have the special election to fill the vacant seats. Unfortunately, the special election means that voters do not get a primary so the party nominees were actually selected by the County Committee — not popular vote — which leads to many additional concerns. As it stands, voters still have to have a general election in September, so their new representative may not be able to get anything done because they will be preoccupied with their campaigns. To make matters worse, there will be new candidates coming in for the general election, so there could be a huge shift after 8 months. Given the short term nature of the position and upcoming deadlines, the “special election” won’t help voters ameliorate the issues that they need to address, and the situation may be more ostensibly complicated. As the graph shows, we speak many languages, including English (main), Spanish (main), Chinese (main), Hebrew, Yiddish, Korean, French, Afrikaans, Arabic, Russian, Serbo-Croatian, and Vietnamese. It is not surprising, considering that the Lower East Side is home to Hispanics, Latinos, African-Americans, Jews, Russian immigrants, Chinese immigrants, and, increasingly, Korean immigrants. Our district includes Chinatown, Jewish tenements, housing projects, and wealthy real estate. We have many different economic groups: low-income, middle class, and wealthy. 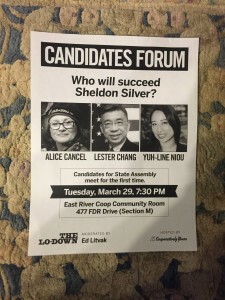 Sheldon Silver was able to bring all of these different interests together on the Lower East Side, and, now that he is gone, many are concerned about the effect that this could have and the divisions it could create. Throughout history, the Lower East Side was seen as an area for low-income immigrants; however, now, it is the “in area” and is hotbed for partying, and high end real estate. Many real estate developers want to invest in the Lower East Side, which could be great for our schools, and our neighborhood programs (including the Educational Alliance, which offers free Head Start, free SAT prep, and senior services) because the monetary gains could be funnelled back to these initiatives. Yet, at the same time, the changes may lead to forced displacement and replacement of low-income groups. For example, in 2014, a local nursing home closed down, and, in February 2015, the property was sold to a real estate company that turned it into luxury condos. If real estate developers have it their way, predominantly low-income groups may be pushed out of their Section 8 housing and forced to relocate. We have seen the ways that gentrification has influenced public policy on the local and national levels, and we have to determine how we will balance the many competing interests. As it stands, we are seeing more young people move in, which means that many new nightclubs and bars are buying property. Given the new demand for property and the influx of real estate developers, the taxes are increasing, which are pushing out the immigrant-initiated small businesses that can’t afford to keep up with the rising rent in favor of commercial businesses (like the new Subway, Dunkin Doughnuts, and 7-Eleven on Grand Street) and real estate. Last night, Alice Cancel, suggested that we maintain our retail diversity by offering tax breaks to the “mom and pop shops,” but it is a tradeoff. We have a lot of underfunded programs, predominantly our schools, and these politicians also want to expand educational opportunities. To that effect, can we really afford to offer the tax breaks? If so, how will we balance the budget? The primary argument for the high-end real estate development is that it will give politicians extra money for our area; however, with the new millennials and bars/night clubs in town, some residents used the Forum to discuss their new concerns with safety, and call for a greater police presence in the area to monitor bars and keep the peace. Yet, it is important to consider the effect of the increased police presence: perhaps more young people will be arrested for public intoxication and that will affect our prison system. Do we want that? Who do we blame? Once again, we have to conduct a cost-benefit analysis: our schools range from excellent to failing, our area is getting more upscale but this may lead to the systematic displacement of minorities and low-income residents, and our politicians are corrupt. How do we deal with it? Do we want rent-control, which would protect minorities and senior citizens from systematic displacement, but would also push real estate developers out at the expense of our schools and programs? Do we want to offer tax breaks to small businesses, and, if so, how will we balance the budget? Should we respond to more nightclubs with an increased police presence? Should we respond to corruption by passing pension-forfeiture so the taxpayers do not have to pay corrupt politicians’ pensions? Unfortunately, these are just a few of the issues that we have to address — and there are many more that affect the state as a whole. As it stands, there are three politicians — Alice Cancel (D), Lester Chang ®, and Yuh-Line Niao (D) — that are seeking our votes in the special election. I am not going to tell you their platforms out of fear of misrepresenting them, nor will I offer my opinion on each of them as a public announcement/denouncement would only serve a personal agenda. Instead, I am going to simply reiterate that, although the 65th Assembly District is small, there is a lot at stake in this election. In light of the Sheldon Silver scandal, it is imperative to stay informed to hold our politicians accountable, and, most importantly, we need to vote in the special election on April 19th. I, for one, am very excited to see what will happen. This is an article from my former student Rory. She’s amazing the way she dissect it and broke it down.